It should be very clear by now that Apple is launching the new MacBook Pros next Thursday, February 24th. Early part numbers were leaked and we heard confirmation that Thursday is the day. More specifically, the Mac maker this weekend began informing some of its larger European resellers that they could expect delivery of sealed product palettes to their brick-and-mortar stores as early as Monday, which coincides with one of ten federal holidays (President's Day) in the United States. While BestBuy lists prices alongside the new part numbers, we are certain that these are simply a placeholder prices (matching current MacBook Pro models) entered by Best Buy. 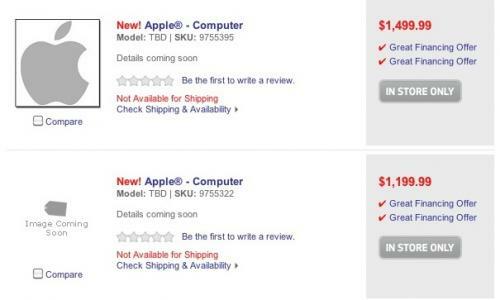 Apple has not told resellers the prices of the new machines. The other wildcard for next week is whether or not Apple plans on unveiling their Light Peak implementation. CNet believes it could happen soon, but isn't certain if it will be implemented in the new MacBook Pros.